The U-Stripe It promises to make it easier to paint stripes on a wall or other surface. The device consists of a pair of straightedges that can be adjusted to a specific width apart and then locked into place. 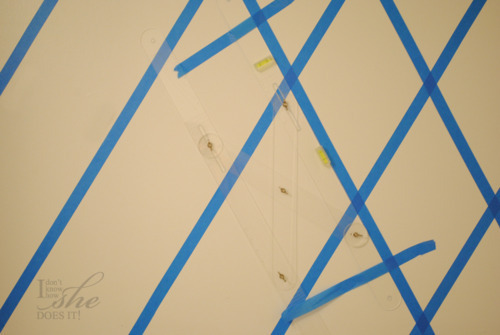 The straightedges then serve as a guide for positioning painter’s tape without the need for pencil marks. 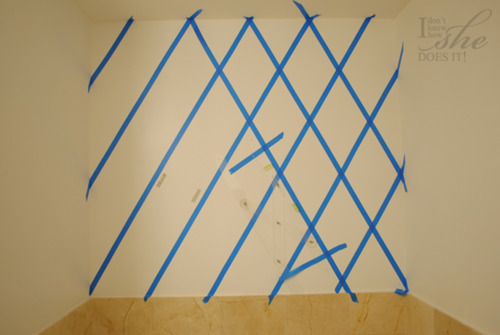 By adding low-tack tape, you can stick the tool to the wall to free your hands for applying the painter’s tape. Levels attached to the device help you to keep it plumb for vertical stripes or level for horizontal stripes. The gadget can also be used for creating circles and other geometric shapes. The U-Stripe It can be ordered for $27.95 at www.ustripeit.com. Shipping is free. February 21, 2012, by: Jenna, Interior Deigner and Writer of NY based Interior Design Firm and Decor Blo, SAS Interiors. …I decided to makeover my son’s room which was a home goal of mine for 2012. It was the perfect spot to make dramatic focal wall with STRIPES! using the U-Stripe It and Design Tool. 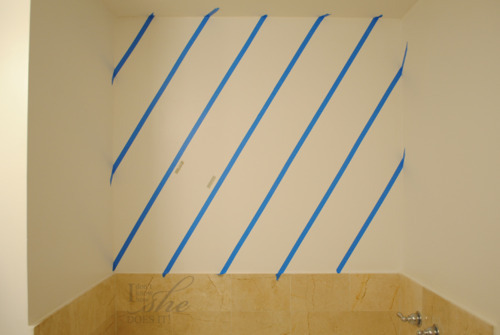 to read the article go to: http://www.sasinteriors.net/2012/02/diy-how-to-paint-stripes-and-product-review-of-u-stripe-it/. August 2010 issue of Paint & Decorating Retailer (PDRA) "Hot New Products-Adding Sizzle to Your Stores!" Mr. Menendez’ story is great — you can read how he took his father’s invention to new heights in the July 2010 issue of St. Louis At Home magazine. At the recent Hardware Show in Las Vegas, U-Stripe It & Design was one of ten companies chosen to be profiled on their network’s Cool Tools show. You can follow them on Twitter or check out their Facebook page. I’m looking forward to testing the tool. Let me know what you think of the possibilities — or your results, if you have used it. Until tomorrow! Are you a DIY-er? Do you take pride in fixing or remodeling things in your home? Do you find yourself offering to help your friends with projects in their home? Perhaps you've just become fed up with the shoddy work that some of the professionals have been doing for you lately. Believe me, you're not alone. Tons of home owners are finding themselves becoming members of the Do It Yourself community. The Do It Yourself community consists of several types. Some home owners have been severely burned by professionals they've hired to do painting, repairs, or remodeling in their homes, and lost patience with waiting to find one that actually does quality work. Others, are simply thrifty and want to save money on the work. The last of you, just do better work than most professionals and take pride in improving their home. All in all, the DIY community is growing each and every year, which means that the demand for quality tools are also in higher demand. Finding the right tool is just like finding your favorite restaurant, you usually end up wasting your time and money on some real duds before you find the one that's right for you. However, we are going to try to make this journey a little less painful. We're going to give you some of the top tools that you can use to repair or remodel your home, that are of the highest value - both in product quality, price, as well as usefulness or versatility. If you don't find what you're looking for in this list, at least it will show you how you should be thinking when you're evaluating a tool for purchase. Remember, tools are meant to be bought, used, re-used, and re-used again and again. Here is a truly innovative and amazing product, that can help DIY'ers and professionals alike. This incredible tool allows you to create perfect stripes, and other designs, with perfect symmetry and measurement. No more crooked stripes because you didn't lay your tape down perfectly, and no more stripes of varying widths. With this tool, your stripes can be perfectly equal, or will be perfectly varied in width by design. The U-Stripe It & Design tool was conceptualized, engineered, and finally patented by a professional painter with over 30 years of experience in the industry. His goal, to create a tool that will allow him to take a job which normally takes 4 - 8 hours of pain-staking measurements, nailing into walls, laying painter's tape using guide strings, and then patching up the nail holes in the wall before he can even begin painting, and turn it into a 1 - 2 hour job with only one tool! His success is now your success... Right now, they are even offering a free roll of their painter's tape with each order, while supplies last. Who knows, you just might like it. The U-Stripe It & Design Tool Get's Introduced to Tim Ezell on the FOX2 Morning Show by Phill! Painting stripes on your walls is difficult, but the U-Stripe It & Design Tool is a crazy gadget that makes it easy. The tool eliminates the need for measuring and marking walls, using levels, straightedges and all the rest of the stuff you would normally need to haul in to do this job. This one tool is all you need. Once you set it up for your design, you can easily tape off the stripes in a fraction of the time. Paint is much less expensive than wallpaper, and this tool costs very little, too. Check it out at www.ustripeit.com, and watch the video to see how easy it is to use. Write to Al and Kelly Carrell in care of the Daily Herald, P.O. Box 280, Arlington Heights, IL 60006 or visit the Carrells’ website at thesuperhandyman.com. Yes, painted stripes look great, but few do-it-yourselfers are foolish enough to think they are easy to do. Yet, despite this the lure of painted stripes is unmistakable. Painted stripes have a transformative power. Wide, colorful stripes add a bit of whimsy to a room, while narrow, more muted lines exude certain sophistication. Yet when it comes to actually painting stripes, the precision work can often be tedious and time-consuming. Now there is a new took that makes painting stripes easier. The tool is called the U-Stripe It & Design tool. The U-Stripe It & Design tool makes these jobs simpler and ensures even lines by combining the qualities of a chalk line, tape measure and level into one handheld tool. If you want to give the U-Stripe It Paint & Design tool a try, there's no need to run to every home center or hardware store in Chicago. For the time being, it is currently only available online here for $34.95. Painted stripes have a transformative power. Wide, colorful stripes add a bit of whimsy to a room, while narrow, more muted lines exude a certain sophistication. Yet when it comes to actually painting stripes, the precision work can often be tedious and time-consuming. Enter the U-Stripe-It & Design tool! Combined with painter’s tape, the U-Stripe-It & Design tool is all you need to create a variety of stripes and designs. 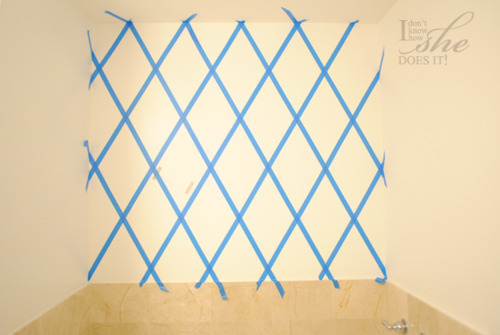 Stripes can be taped off using three steps, which require less of a time commitment than manually measuring, leveling and taping your striped design. The U-Stripe-It & Design will set you back $34.95 and can be ordered directly from the website. Are you inclined to order a tool like the U-Stripe-It & Design? Be sure to send us pictures of your striped rooms – we’d love to see them! With four kids and a more then full time job it doesn't leave a lot of time for my husband to complete these projects. It took almost two months after we bought the paint for the house, for him to complete the living room, den and dining areas. So I tried to be a help and paint the bedrooms. I didn't do bad, I didn't do great, but they are livable. I really wanted to do something creative in my daughter’s room. I wanted her room pink and purple and even bought both colors. Last minute I chickened out and went with all pink and some decals because I just new I would mess something up! Well last week I was introduced to this pretty cool tool called U-Stripe It. 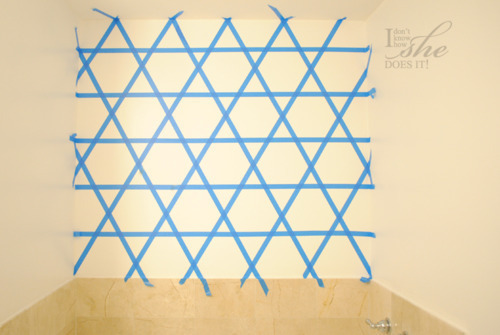 This tool allows the DIY/Moms to paint stripes and/or other designs on their walls without using math, pencil marks, plum lines, chalk lines and/or laser/construction levels. All you need when using this tool is the U-Stripe It & Design Tool and delicate painters tape. Using this tool also cuts your time in half. I say Phil Menendez was great to work with because with his words of encouragement and his Father's wonderful Mom friendly tool, I was able to bust out the purple paint that has been sitting in my garage...and get CREATIVE! Now don't get me wrong I didn't start off by trying something crazy. I went with simple vertical stripes. Also I should mention when I say I started off simple, I mean that. I did only three at first as a "test" run because I was still sure I would mess up something. And figure painting over half a wall would be easier then the whole room. I was impressed with how quick and easy it was for me and my "three stripes" worked out perfect and gave me the courage to continue. The tool was simple to use. Just set it to the line/stripe width you want to create, tighten the wing nuts so it stays in position, position on the wall, check the attached level and place your paint tape along the edge. My wonderful daughter pulled apart my adhesive tape so to make it a little easy I put push pins in the holes to hold the tool in place. This also gave me a marked to move it down to the next spot on the wall. Here are my before and afters.. It's not yet complete but I think for me I did a great job. I can't wait to finish the rest. And best of all my daughters loves it! Spring is finally arriving! At least it is in my neck of the woods! That means time to clean up the house and fix it all up! One fun project to tackle is painting! And one thing I like to do is adding stripes! They give your walls dimension and looks so nice! But it can be really difficult to get them straight and even. That is why I love the U Stripe It design tool! The U Stripe Design tool is only $27.95 and right now you can get a free roll of painters tape when you buy it! This a great deal for the tool because you can use and reuse it so many times! The tool was created by John Menendez, a painter for the last 30 years. He used it on his jobs, and when others saw it, they thought it would be easy for anyone to use and convinced him to market the product. This turned the work of the professional look of stripes into a job for the average person! His son Phillip Menendez is the distributor for the tool. My husband and I are in the process of several home painting projects. While we really enjoy picking out colors and design, doing the actual work can be a bit of a bear. Through our home projects one of the things that we've noticed goes a long ways towards making a room look classy is crisp and clean paint lines. It sounds easy when you are at the store picking out the brushes, rollers and tape but doing the actual work is another story, especially with a one year old running around. The U-Stripe it & Design Tool is the perfect tool to help your next project look professional and save a ton of time. Its simple design makes it really easy to use but you will be amazed at how creative you can get painting stripes, plaids, chevrons and other designs. We've always loved painted stripes which can give the look of expensive wall-paper but found that taping off the walls was much too time consuming especially when you come to realize that you put the tape on crooked. With the U-Stripe it and Design Tool you can get the job down much quicker without the worry that your stripes are not evenly spaced or straight on the wall. We think you'll really enjoy using this tool and we are looking forward to getting really creative with it on our own walls. This tool was named one of the Top 20 Cool Tools of 2010 by the DIY Network. We started with the base wall being cream. We measured out I believe 8” for the light blue stripe; then 6” for the dark blue stripe; and 10” for the dark brown stripe. Then we kept the cream in there as some of the tape lines – because we didn’t want to leave cream out, but didn’t want an abundance of cream. The tricky part here was that we decided after painting the dark blue stripes and letting it dry, that we would move the tape over so we could have the brown cover the entire middle between the two dark blue stripes without showing space. Which worked for us, but was a whole extra step. All in all – with 4 children under 3 in the house; it took us about 3 hours to tape the wall and paint the dark blue; then my friend had to go; and it took me about 4 hours to finish painting and re-taping the dark blue on my own (with two kids in the house). So really not so bad! I have to say at first; I didn’t LOVE it. I didn’t hate it – but I’m a very visual person and I need to SEE something complete before I know what my thoughts are… Just ask my website designer… So I wanted to get the decorations all complete before I showed you. The painting was done at the end of February, and it took until this week before I finally got my act together with making another curtain sham (I already had one, but it was too small) and I had to buy frames, and paint shelves, and buy and paint letters – and just get it done. It’s still not TOTALLY complete; but I’m much happier with how it is now vs. how it was two weeks ago. You might notice that none of the picture frames have anything in them yet. I have printed some photos to go in them; but still have to install them. I have a matte for the picture on the wall above the crib; but the frame wont close with the matte; so I might need a new frame. I also have a cute train that will sit on the shelf above the crib (as soon as it comes out of whatever box it is in!). So The U-Stripe It & Design tool works really great. Much better than all the measurements that you see on HGTV when they’re trying to do stripes. This is much easier. If we would have done basic two tone stripes where one of the colors was crème; I would have been done in less than 3 hours for sure (with 4 toddlers/babies in the house). 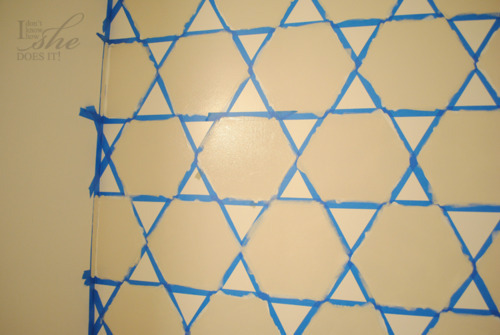 Painting hexigons on your wall, very easy to do. The one that had me at hello was the hexagonal one (second from left to right). For me this form is a circle wanting to be squared. The first thing I did was a digital drawing as a reference to help me discover the angle at which the diagonal lines needed to be (60 degrees). 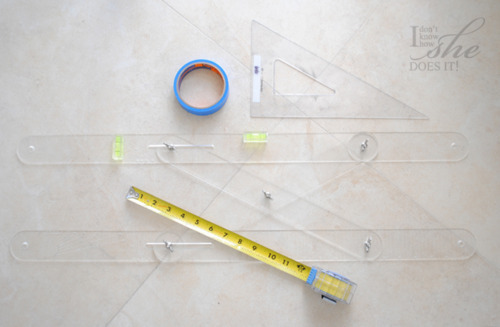 The materials are very simple: ScotchBlue Painter’s Tape, 60 degree set square, U-Stripe It tool, tape measure. Now that I knew the angle, I use a 60 degree set square to draw the first line. After this, the rest was easier to do with the U-Stripe It tool. I only had to make sure that the distance between each line was the same from side to side and then from top to bottom. Step 1 Start with the diagonal lines after deciding on the degree of the angle. See how nice the tool assisted me on the task. Step 3 It’s starting to look like diamonds. Step 4 The end result are stars. 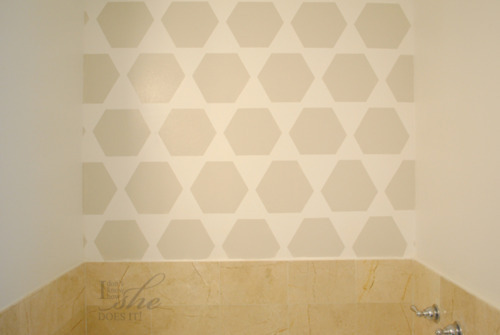 Step 3 Just paint the hexagonal part of the stars like on the second picture above. The U-Stripe It comes with a level which makes the task very smooth and it is easy to lock in place after you decided the width of the lines you want to paint. Here is the resulting painted wall. I really loved the outcome. It took me no more than an hour or so to make these lines. This tool made my hexagonal design a breeze. One of the great transformations I will be talking about in a latter post is lightning. As you can see in this photo, the illumination of this area is very poor and everything ends looking yellow. To read this entire article you are please visit: http://knowhowshedoesit.com/post/18559336351/today-is-my-day-number-1-on-my-kind-of-a.